Check yourself before you wreck yourself. First of all, I am not talking about the 12 year old that just wandered in to get their driver’s license. Although, that is quite scary and I am pretty sure they are actually age 16. I am talked about the absolute train wreck of outfits that you not only see in the DMV, but in person at networking events. First of all (and again, this is not as bad at professional events vs. DMV), I personally witnessed the largest of fashion disasters in the history of cutting holes in your jeans (think 80’s). Apparently, this gal was not only locked into 1982, but decided to take garden sheers to her jeans to a point that everything in the upper thigh area was missing. Train wreck number two involved a thong that everyone had the pleasure of staring at while they waited for their number to be called. My point? The same goes for networking events. If you wear something so completely obnoxious, people are going to focus on that and not doing business with you. Check in before joining in with the peanut gallery. Here is the deal: If you are going to sit in the DMV for hours, you may start to lose it. You may even do things to entertain yourself at some point, like make friends with everyone in your row and convince the whole row to cheer loudly, yell, and clap when any one of said row mates number gets called up. I may or may not be never allowed in the Folsom DMV again, but you should always watch what romper room group you decide to get involved with. The worst offenders in this category would be the table of gossipy, chatty people who talk incessantly through a speaker’s presentation. First, you are being rude and royally annoying the speaker. Second, the rest of the room will be so annoyed by your table’s behavior they will not want to do business with anyone sitting with you. 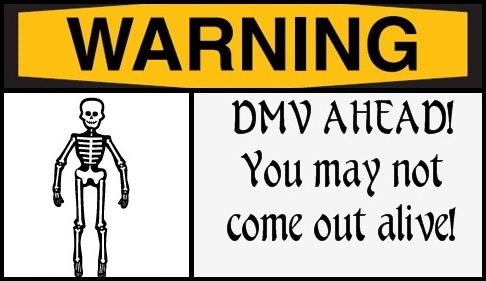 Just don’t do it and save your shenanigans for the DMV. Capri Kaput. This certainly was not last of the characters, but definitely one of the memorable ones. While I am waiting to be done with what I would like to describe as the most painful DMV appointment on the planet, I am sitting by a gal who is not only sucking up her Capri Sun (and, she was not of elementary school age), but sucking it dry. I am talking about sucking it dry to a point I did not know whether to start laughing out loud or start staring at her to see if her face started to cave in. My point? In group events, really mind your table manners. If you are going to be slurping anything, chances are everyone at your table is going to be listening you annoyed vs. listening to the event facilitator running the meeting. Put a kaput on the Capri in other words. Capri Kaput. This certainly was not last of the characters, but definitely one of the memorable ones. While I am waiting to be done with I would like to describe as the most painful DMV appointment on the planet, I am sitting by a gal who is not only sucking up her Capri Sun (and, she was not of elementary school age), but sucking it dry. I am talking about sucking it dry to a point I did not know whether to start laughing out loud or start staring at her to see if her face started to cave in. My point? In group events, really mind your table manners. If you are going to be slurping anything, chances are everyone at your table is going to be listening you annoyed vs. listening to the event facilitator running the meeting. Put a kaput on the Capri in other words.